In 2009 a group of young artists came together to create cross-artform work A Tale of Winged Things, inspired by the poetry fragments of Sappho. From this work, Weave Length Productions was formed, named so by writer/performer Smiljana Glisovic. Don't miss her new collaborative theatre work We Were Almost Entirely Happy this September at La Mama Theatre. The loneliness of this inexpression causes weird pain. In 1938, Elizabeth Smart, browsing in a bookshop in London, discovered George Barker’s poetry, determined to marry him, and began raising the funds to bring him to her home in Canada. George and Jessica Barker arrived at the bus stop in June 1940. Elizabeth Smart was there to pick them up. We Were Almost Entirely Happy is an exploration of Elizabeth Smart’s By Grand Central Station I Sat Down and Wept (1945), and George Barker’s The Dead Seagull (1950). In each, Smart and Barker detail a ‘fictional’ account of their life-long love-affair. I was writing about one thing: the emotion felt by a woman in love. Big Space is up and running as a shared artist and photo studio with collaborative work and hire opportunities! Amy is keeping busy, curating and presenting a 2 month window box gallery and event series called Box Space- check out all the details on the Big Space website. This Friday she will be chatting with featured artist Kelly Grundy at 6pm, come say hello and enjoy some fine vinyl from Mr Bren Luke. See you there! 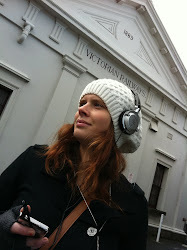 119a Sturt St, nestled in at the front of the beautiful Ballarat Mechanics Institute.